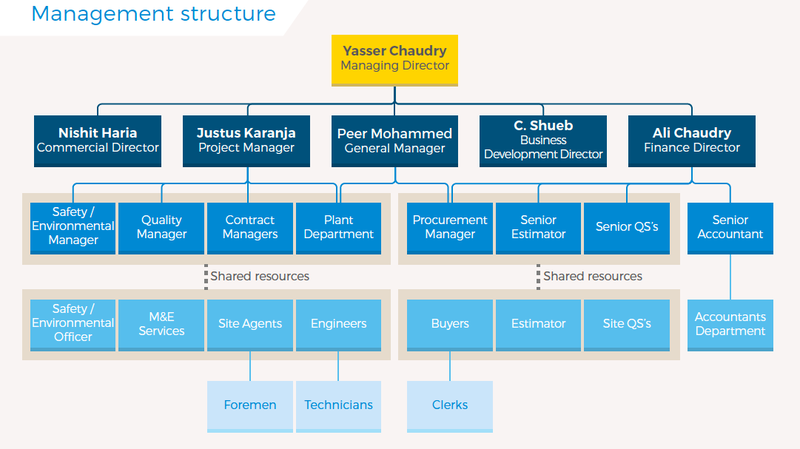 Yasser steers the strategic direction of the group and its engineering services division. Yasser draws upon his wide experience in donor sponsored infrastructure and development projects for the benefit of SAWA clients. Nishit Haria, manages the group’s regional and international business interests and oversees its Trading Division. As a member of the board of one of Kenya’s largest companies, Nishit received numerous accolades during a career that spanned more than 30 years. Ali draws on a successful background in professional financial management and marketing. He is responsible for the group’s financial direction and its procurement division. Ali additionally leads the group’s central tenders team in contractual negotiations. Shueb aligns the group’s sales strategy with its corporate objectives. He leads the communication strategy to emphasises continuous improvement, sustainability, quality, safety and regulatory operations to increase effectiveness and awareness at all levels. Peer manages the group’s regional interests. He collaborates with clients, government sectors, community organisations, and employees in order to cultivate ethical business practices that are sustainable. Justus oversees development projects from conception to completion. He ensures our people and partners achieve best practice construction techniques, whilst monitoring compliance with building and safety regulations.